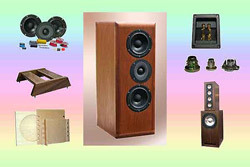 Our series of articles provides the speaker builder with some basic technical information on the use and application of components and materials found within this site. It is not a definitive list but is intended to provide the enthusiast with tips and general material information not generally mentioned in kit instructions. Additions to the list will be made as time allows so keep looking! Recently added to our Article listings. (1) A brief review of Loudspeaker Crossover Inductors hints, tips and 'do not's'. More to follow, watch this space.